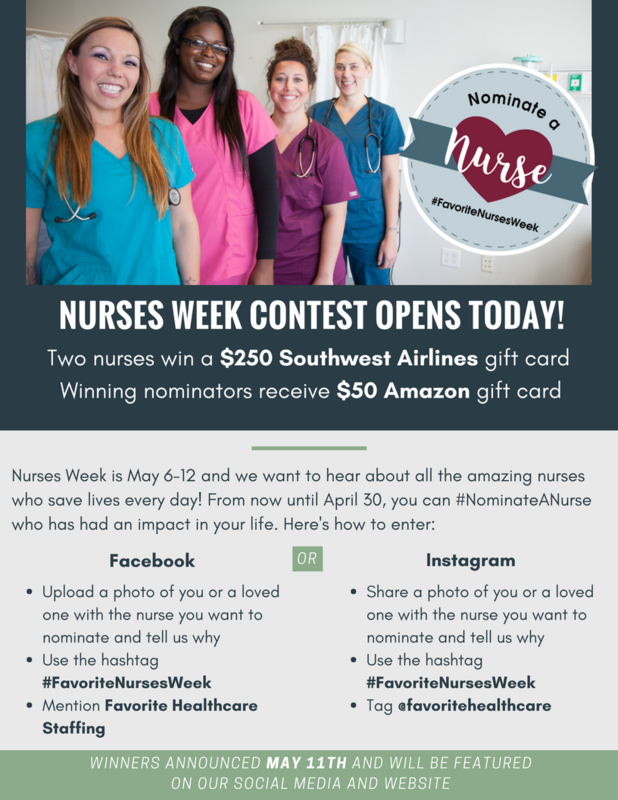 Contest: Nominate a Nurse for National Nurses Week | Favorite Healthcare Staffing Inc.
Each year, National Nurses Week begins on May 6 and ends May 12, Florence Nightingale’s birthday. Although we appreciate nurses every day of the year, we always enjoy the opportunity to publicly recognize incredible nurses during Nurses Week. Nurses truly are the backbone of healthcare, serving with passion, kindness and a commitment to their patients. This year, we are celebrating Nurses Week with a social media contest to honor those who have a tremendous impact in our lives. Is there a nurse you would like to recognize for his or her devotion to the field? Enter our “Nominate a Nurse” contest on social media for a chance for you and the nurse you nominate to win! Check out the flyer below for more info on how to enter or download the PDF version here.